After removing the cylinder head for a valve inspection and possible valve job, we discovered piston #3 with evidence of connecting rod bearing issues or possible main crankshaft issues. We could identify this by the scoring marks on piston #3 where it hit the intake and exhaust valves. We also had movement on piston #3 from top dead center. When tapping lightly on this piston, it moved down slightly; the other two pistons did not move at all. This was NOT GOOD. 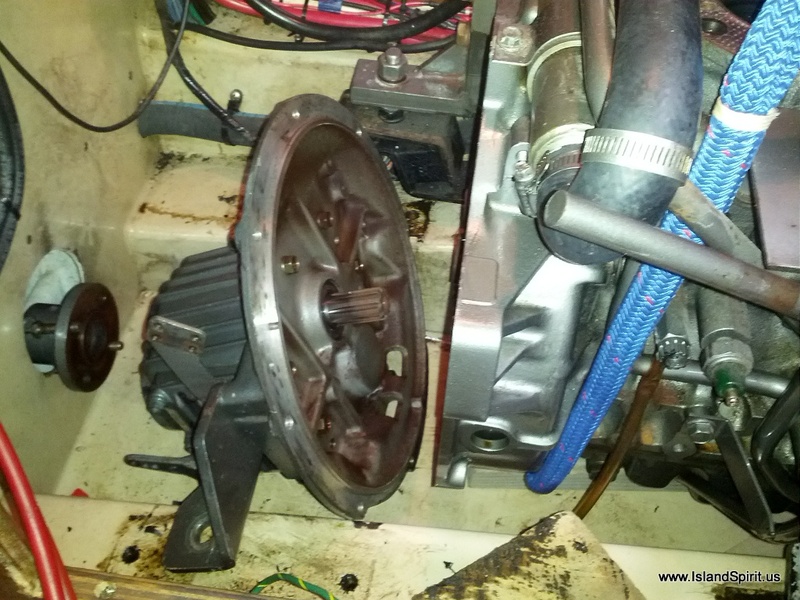 Now we needed to remove the entire engine block to gain access to the oil pan and to inspect the crankshaft and connecting rods. The question still remains, WHAT HAPPENED? We know we had an overheat to 255F for about 5-10 minutes. We found we have a partially blocked mixing elbow. We know we had one impeller blade break off. So, we were looking for the problem to be with the valves in the head , but now we found a problem in the piston. So, out with the block. We lifted the engine out using our main halyard and one spare halyard as a safety. The block might weigh about 300 lbs. We received great advice from fellow IP owner John D. who told us to add in the use of the jib sheets to control the lift. This turned out to be the real secret to lifting the engine out ourselves. We originally had planned to be towed over to the next marina where we had hired a crane operator to lift out the engine. But, lucky for us, we have a very good friend and master mechanic here in town, Don B, IP420 Hallelujah. Don helped us with the lifting, moving down the dock and loading. We lifted the block to the cockpit stoop, then to the cockpit floor, then to the cockpit seat and then to the dock finger pier. It was amazingly controlled and easy. The final trick was to use the finger pier piling with a sheet line back to the motor and the jib winch. This allowed us to winch the engine out and off the boat by pulling with the winch around a piling on the finger pier. Brilliant. It all worked very well and only took about 30 minutes to lift the block and secure it on the hand truck. Down the dock we wheeled it to the parking lot where Don used a Kubota tractor to lift the engine into the rented Uhaul van, where we secured it on an old tire. Good idea, Freddie! We drove it to my other mechanic Chris O. in Stevensville, MD for evaluation. The next day, good friend Jeff G. IP35 Lucille and Radeen and I drove to Chris’ place where he directed us on how to take apart the lower block and pistons. There he showed us the spun connecting rod bearing on piston #3. Time for a rebuild evaluation. The next day, Chris called and informed us that the cost of parts, machining the crankshaft and replacing the heat ex-changer would run $6,500 plus labor for rebuild. He thought it was not worth rebuilding. So our wonderful and reliable Yanmar 3JH2-E engine that has run over 10,000 nm is dead! We will need to re-power Island Spirit. The cause: Blocked or poor oil delivery to connecting rod bearing #3, all other bearings were perfect! Added to this problem was a restricted exhaust mixing elbow. Island Spirit will get a new re-manufactured exact replacement engine in 3 weeks. Radeen and I along with Don, our friend and master mechanic, will install the engine. You do know the acronym B.O.A.T. don’t you? The start of pulling the engine. We took the aft line and went around a piling to pull it aft, then up and off the boat. This new GMC van was surprisingly quiet and comfortable! We all tried our best to fix this engine…..but…. We now await the delivery of a re-manufactured Yanmar 3JH2-E, our exact replacement engine, which we will install with the help of Don B. What will we do differently next time???? CHANGE OUT THE MIXING ELBOW EVERY 3 YEARS (if in salty ocean water) They cost about $200! Have an engine oil analysis EVERY YEAR using: http://www.blackstone-labs.com/ Thank you Rich W. (IP350 Azure Leizure) for that reference. Change the impeller EVERY YEAR. Why NOT? Ours was 1 year old and with only 6 months of use. It was fine the morning we left, but it broke one blade. This may have contributed as well. Sorry for the problems folks but amazing job on pulling the engine and getting down to the source of the trouble. I guess its really true… It does take a village to repair an engine. I use blackstone labs for every oil change on the truck. It helps identify any trends when they start. Did the same for ei' Lean. It's great that you have such a fantastic support system there at Rock Hall. No surprise why you do though. Hope all goes smoothly on the replacement and you are back on the water pronto. Wow, way to go team Island Spirit ! Didn't know all of this was going on during the week. Good luck with the re-power.